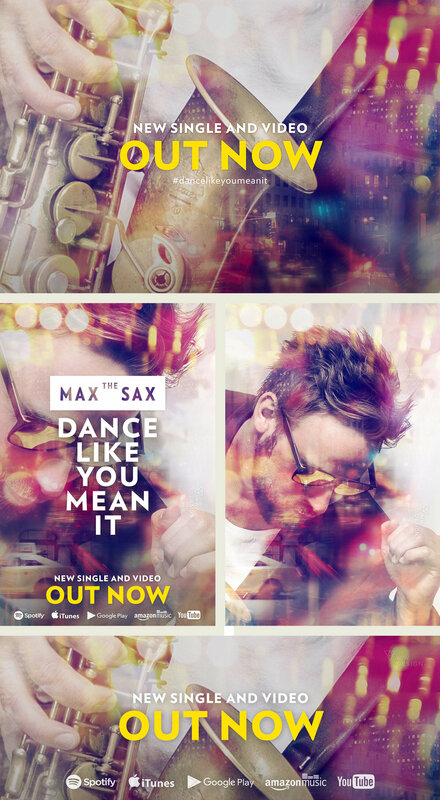 MAX THE SAX's first solo single, 'Dance Like You Mean It' is three and a half minutes of booty-shaking brilliance. The video is an explosion of pure happiness as random passers by in New York, Paris, Sydney, Munich and more dance spontaneously to the infectious beats of the track surrounded by a backdrop of summer vibes, disco balls and cityscapes that will make you want to drop everything and move to the groove. Derived from the music video, I also created the cover design in the same style of the video. I wanted to capture multiple shots by using the double exposure effect, bringing those rich visuals onto paper. Moreover, I did the whole social media promotion with teaser clips, flyers and artworks.